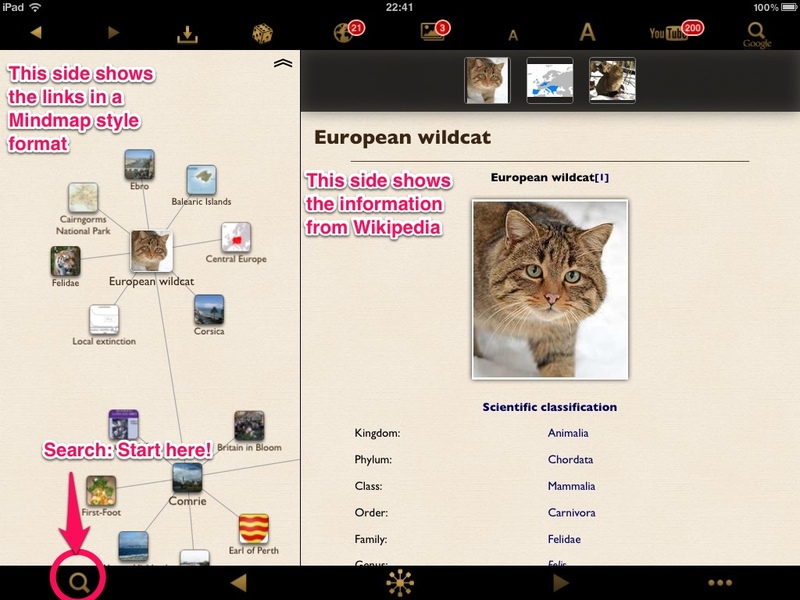 I’ve found a great little iPad app for accessing Wikipedia. It’s simple enough to use, but I really like it because it introduces a wonderful level of spontaneous discovery that could just be enough to help you over a case of writer’s block… or at least keep you entertained for longer than you meant. 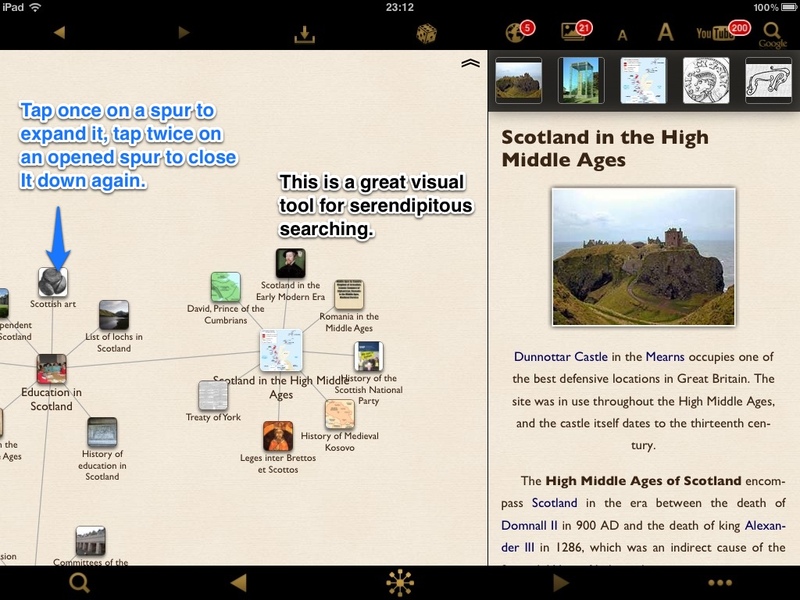 More importantly, it would be a fabulous tool to have on a school iPad for learners to use. The tool is WikiLinks and is one of the best (ie: prettiest) Apps for accessing Wikipedia on the iPad that I’ve found so far (My copy of Discover has stopped working on my iPad 1, so I needed something else). The ability to access Wikipedia and save the pages for offline reference would have been reason enough to recommend the App, but it has a truly wonderful visual element that encourages one to delve further into a topic with a simple tap of the screen. The visual links suggested are not always obviously related, which encouraged me to tap on them to find out more… and before I knew it, I was transported into all sorts of loosely related and (to me) fascinating backwaters of learning. I was completely engaged in reading and learning in a way that reminded me of the time I first encountered a copy of Brewer’s Dictionary of Phrase and Fable. For me, WikiLinks is a great example of an App that encourages deeper learning, shows what could be possible when we are allowed to access online tools in school, and that demonstrates that sometimes the nature of the technology does allow us to work in newer ways. All in all, WikiLinks is highly recommended — and especially as it’s currently reduced to only £1.49 The price is back up to £2.49, but, it is still well worth it… especially as it’ll also run on your iPhone/iPod Touch! 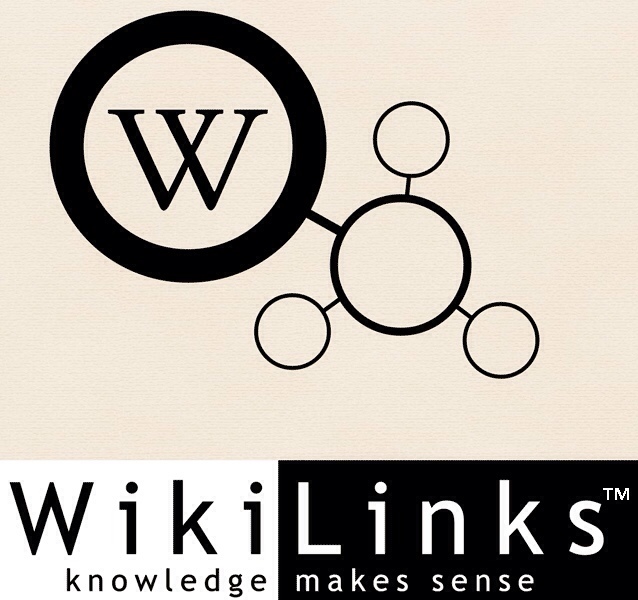 Visit the developer’s website for more information: WikiLinks.net. Enjoy.